Yesterday we talked about how the FAFSA season is upon us, and gave you a crash course in how to become a financial aid whiz. So now that you're a total FAFSA expert, you'll be interested to hear this next story. It's about Michelle Obama, and a new contest she has just announced for creating videos about your FAFSA experience. And if she likes your video the most, she may even come to speak at your high school's graduation ceremony! Here are the details from the White House web site. With “FAFSA season” just around the corner, First Lady Michelle Obama is calling on every high school senior in America to complete their Free Application for Federal Student Aid (FAFSA) starting on January 1st, and for students, principals, teachers, school counselors, and administrators to show us how their school is taking action to get more students to fill out their forms. Already, we’ve seen schools around the country use creative approaches to encourage more students to fill out their FAFSA. Now, we want you to create a three to five minute video that highlights how your school is stepping up. Then, submit your entry here and share it on social media using #ReachHigher. 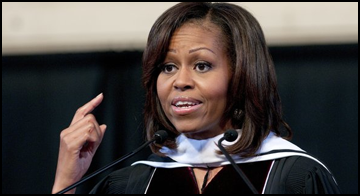 Not only will you be making a big difference for your school and your students, but the First Lady could be sending your school a special video message or speak at your commencement ceremony next spring. Watch the video below to see the First Lady give more details about this competition. And let us know your thoughts in the comments section below. Will you be creating a video and sending it to the First Lady?